This article will show you how to sync your tasks with Google Calendar, iCal, and Outlook. Click Tasks from the top navigation menu. Click the [Google Calendar] link. When prompted, confirm that you want to add the Paperless Pipeline calendar. In the top right, click [Settings]. 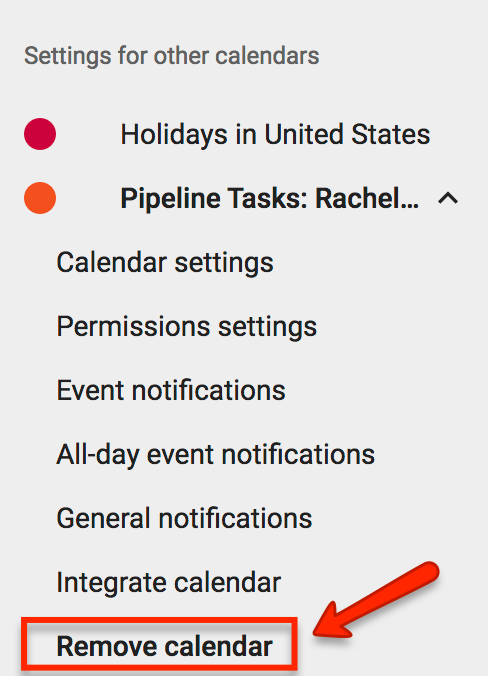 In the left column under the Settings for other calendars section, select the "Pipeline Tasks" calendar you want to remove. When prompted, confirm that you want to open the calendar. When iCal opens, click [Subscribe] to add the Paperless Pipeline tasks calendar. Right-click the Paperless Pipeline tasks calendar that you want to unsubscribe from and select [Unsubscribe]. Tap Settings > Accounts & Passwords > Subscribed Calendars. Tap Subscribed Calendars, and then tap the Paperless Pipeline tasks calendar that you want to delete. Tap Delete Account, and then tap Delete Account again to confirm deletion. If prompted to select an app to open the link, select your version of Outlook. 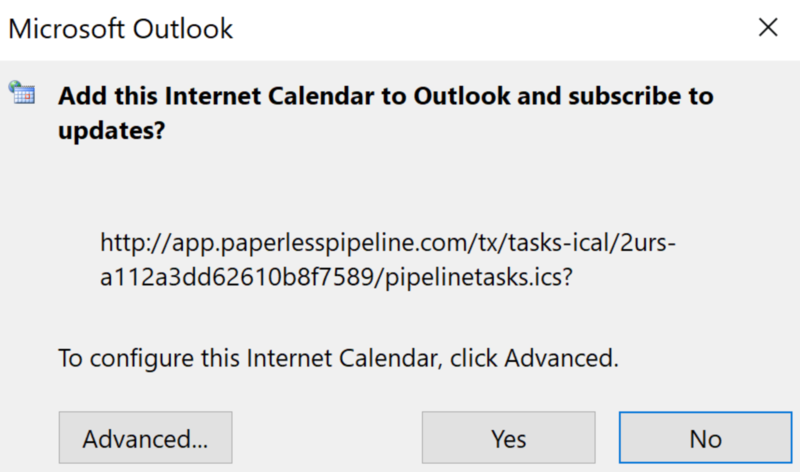 When Outlook opens, click [Yes] to add the Paperless Pipeline calendar. In Outlook's Calendar, in the Folder Pane, right-click the Paperless Pipeline task calendar that you want to delete. Click [Yes] to confirm deletion. When you unsync (unsubscribe) from a Paperless Pipeline tasks calendar, it won't be visible again unless you resync it following the appropriate steps for the calendar of choice outlined above. Sync times may vary but generally occur every couple of hours. Q: Why can't I sync my Pipeline tasks in Outlook for Mac? Copy the Outlook Calendar link from your Pipeline Tasks page. While hovering over the Outlook link, right click, then select Copy Link Address. Log into your Outlook account and go to your Calendar. Right-click in the navigation pane where you see Other Calendars. Select Open Calendar. Paste the copied Pipeline URL into the Internet Calendar box. Once subscribed, the calendar will appear in Outlook for Mac the next time you launch the program.